I’d like to take a short break in my audio-cassettes-included-with-classic-computer-games series to ask a question: What series have you tried to collect, and why? 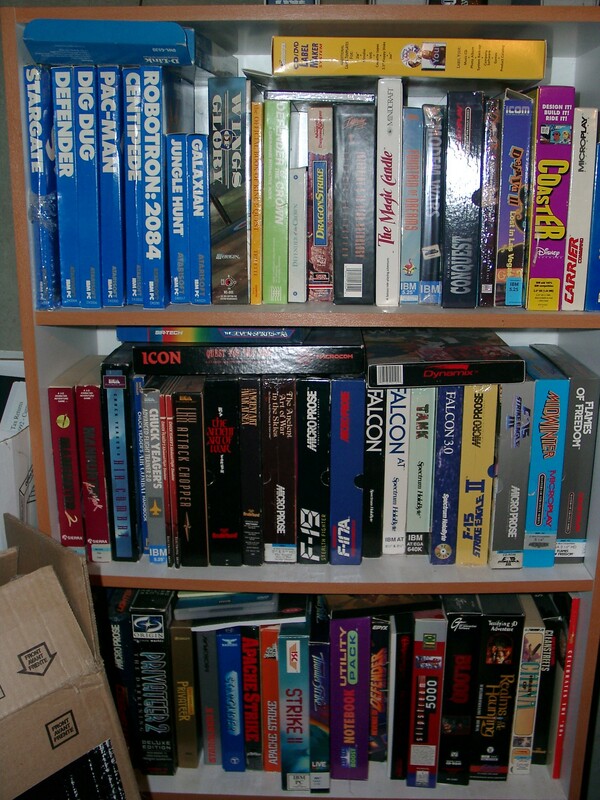 Most collectors of classic game software tend to focus on an entire company (Sierra, Infocom, Adventure International, etc.) while others tend to hone in on a particular series (Wizardry, Ultima, etc.) I am guilty of both, but my collection is biased towards series that may not seem to be worth collecting, have any relationship to each other, or have any rational pattern (even to fellow collectors!). What I collect reflects why I like old PCs as a hobby: Not because “old komputers R k00l” but because “what people did to get past old computers’ limits is k00l”. If a game was really well-programmed, or had great graphics, or managed to produce audible sound out of the beeper, it gained my admiration. Sure, story and gameplay mechanics are a contributing factor, but they’re not the main focus of my collection. Another odd thing about what I collect: It’s 99% PC. I have some Apple II, Mac, and C64 titles, but those have been donations I’ve promised to take good care of, and I have. My heart lies in the original PC, mostly because it was the hardest platform to get a decent game experience on, making successes all the more impressive. This is atypical; most of my fellow collectors don’t discriminate platforms like I do. All the PC versions of Cinemaware adventure titles: Defender of the Crown (including the euro bootable EGA/Tandy/3-voice version), King of Chicago, S.D.I., Sinbad, The Three Stooges, It Came From The Desert, Rocket Ranger. Cinemaware games were a mixed bag: Awesome graphics, music, and sound — on Amiga. Other platforms usually got worse graphics and sound, but better gameplay because they would tweak some games between platforms. Play the original Defender of the Crown for Amiga and you’ll find it is nearly impossible to win. Play it on C64 or PC, and you’ll find it’s a much more balanced game. Anyway, the graphics rocked CGA at the time. Deus Ex series: Deus Ex, Deus ex 2: Invisible War, Project: Snowblind. Snowblind? Yes, Project: Snowblind was originally developed by Crystal Dynamics as a spin-off of Invisible War, but when DE2:IW sold poorly, the story and assets were changed somewhat to distance the game from a then-failing property. Playing the game, however, reveals much of the familiar Deus Ex biomod mechanics, and the story — while taking a backseat to action — smells heavily of conspiracies, like all Deus Ex games. Would you be fooled by this? Access adventure Series: Mean Streets, Martian Memorandum, Countdown, Amazon: Guardians of Eden, Under a Killing Moon, The Pandora Directive, Overseer. Access knew that the best technology could sell games, even if the story was a bit lacking. Their engines had (crude) motion video, digitized audio, and 256-color graphics as early as 1989. Later games like Under a Killing Moon and Pandora Directive also had a great engine with pre-rendered lights and a fully-textured world to explore. While I loved all of them, my heart belongs to the Mean Streets engine because it used 256-color VGA graphics as the base data but would FS dither to all common lower graphics modes as well. It’s a small collection compared to some of the superstars of my hobby, and I’ve had to pare it down over the years due to financial hardship, but I’m happy with what I have. It’s special to me, and that’s what counts. This entry was posted on August 12, 2010 at 10:30 pm	and is filed under Gaming, Vintage Computing. You can follow any responses to this entry through the RSS 2.0 feed. You can leave a response, or trackback from your own site. I collected all 6 Mega Man games for the 8-bit NES in the early 00’s, for no good reason. Held onto them for years and then recently donated them to a video game museum. Never even played numbers 5 or 6. Other than that… I guess I’ve collected all 4 Deer Avenger games (Deer Hunter parodies) and for the most noble cause of all: To document them all via MobyGames (done!). I think I’m also well on my way to collecting every Barbie game and every schlocky merchandising tie-in game every published. I couldn’t help but notice the Atarisoft PC collection in the photo. Is that another example of games going beyond the platform? I’ve never played any of them on a PC. I had a chance to buy a new copy of Atarisoft Donkey Kong for the PC back in the mid-90s, but the store still had it marked at something like $40, so I passed. Atarisoft: Actually, they’re not except maybe for Battlezone. They’re all very capable games, but mostly I collected them because they’re all booters and they all have the same type of packaging. Oddly enough the Apple IIgs port of Silpheed is one of the only games that uses the machine’s 640×200 video mode for gameplay. In terms of graphics and sound, the Amiga got the best video, The IIgs had the best sound, and the Atari ST was always in between. Will Harvey games (Zany Golf, The Immortal) definitely favored the IIgs. I haven’t played the IIgs ports of the Cinemaware games, but the graphics look fairly good. I just played Defender of the Crown in a IIgs emulator and it is also enhanced from the original — there is one more battlefield option, and you can continue your turn after buying more army. Graphics are not a direct conversion because original was 240 lines while IIgs is 200 lines, but they’re still nice. Music appears to be a direct port. Will Harvey cut his chops on 6502 assembler so his games were always created on or for Apple first. Its a shame so many companies didn’t take advantage of the Ensoniq 5503DOC in the IIgs. People were making 15 track mod files on those machines well before the Gravis Ultrasound (based on the 5506DOC) came along. The only 15-channel examples I’ve heard on the IIgs came from Deluxe Music Construction Set. Any other examples? The program you are looking for is SoundSmith (15 tracks, sampled limited to 64k DOC RAM) which was used extensively by FTA to create music in their demos. Check out the Modulae and XMas demos for some good tunes. Later on the FTA guys developed Noisetracker which swapped samples into DOC RAM in real time to break the 64k barrier and even allow direct playback of Amiga MOD files…at the expense of using CPU time. 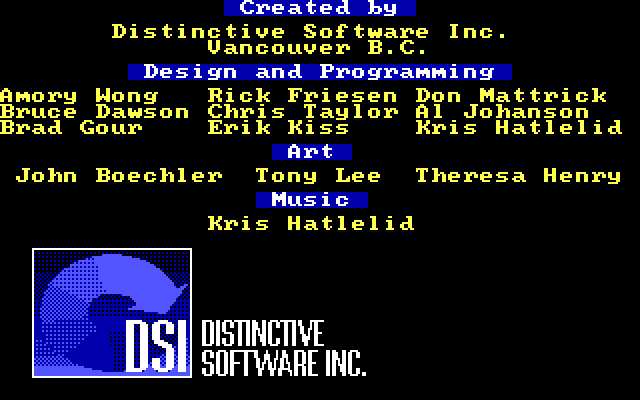 The FTA Delta demo has a really nice mix of “Dragon’s Funk” on the credits screen that uses Noisetracker for playback. 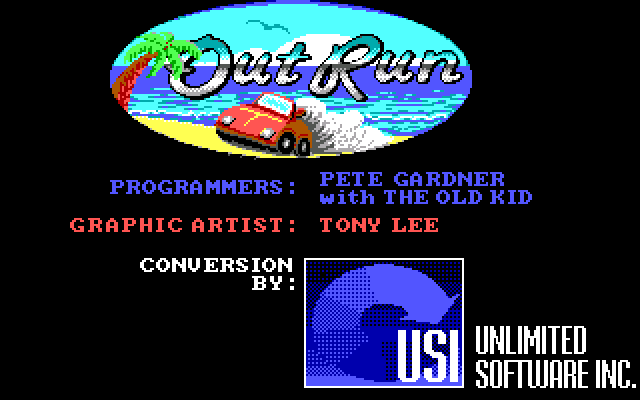 In the PC version of Outrun, right after selecting a graphics mode to play the game in, press Tab to get a slightly altered credits screen: it shows that the Old Kid is really *SPOILER*Amory Wong*SPOILER*. I asked him why his name isn’t always shown on the credits screen and he said he couldn’t remember and it was probably not his decision. Couldn’t get it to work for me, but I believe that it was him (makes sense given other DSI credits). Here’s a screenshot. It’s much easier to get it to work in DOSBox when the cycle count is set to 1000 instead of the usual 3000. You know, it’s funny but I actually found the Amiga version of Defender of the Crown one of the easier versions to beat. For me, I think a large part of it was the fact that buying troops didn’t end your turn like it did in the CGA version – which I’m pretty sure I haven’t beaten. I also remember, though, that in the Amiga version you would sometimes get assaulted by an enormous Norman army just a couple of turns into the game. If that happened, you were pretty much toast. I eBayed all of my classic games a couple of years back, so I definitely understand how it feels to have to pare down your collection. Someone in Germany bought most of them. The day that I packed them up was a very sad one. Good point about buying troops — that did indeed make things tougher in other versions. As for feeling sad, if your games went to another collector, then don’t feel too bad — they’re still being cared for. I stumbled upon your site after doing some research on the fabled Option Board, which I believe I have stored in my closet somewhere along with my copies of all my tools from a long gone era. I actually cried a little when I saw the photo of you vintage game shelf. My first PC game purchase was Atarisoft’s Stargate in all it’s CGA glory so that was a tearjerker, but the game that stimulated the most neurons was Ancient Art of War. I still remember that 8-bit speaker music playing in my mind as I played scenario after scenario. I kept all my Electronic Arts titles for the longest time… Archon, Pinball Construction Set, Hard Hat Mack, Seven Cities of Gold, and my personal favorite – because I was a Software Tester for it back in the day, Starflight. I’m surprised not to see Gato Sub Simulator on the shelf being that there’s so many full package simulators there. Anyway, wonderful, WONDERFUL blog. I was never very good at AAofWar but I still enjoyed trying to play it. The only person I could beat was Krazy Ivan, as he was, of course, krazy. You were a tester for Starflight? I am in awe! That game was so incredibly deep for two 360K floppies, it was way ahead of its time. Any good stories to share?